Andrew W.K. has announced a tour celebrating his debut’s 10th anniversary. When his ‘I Get Wet’ album first exploded onto an unsuspecting public one decade ago, it quickly polarized audiences with an intense sound and even more intense front man. Ten years later, Andrew has decided to do put on a special show in honour of his origins. The band will perform every song from his groundbreaking release, in album order, every night of the tour, including appearances at the Austin, Texas, South By Southwest Festival in March. Originally released in 2002 on Mercury Records, ‘I Get Wet’ was W.K.’s urgent rally-cry to the world. At a time when culture was saturated with pessimism and shadows of negativity, nihilistic messages tended to rule the airwaves. Ten years ago, it was difficult to find any contemporary songs about partying, fun, or positivity. The major-key club-rock sound of ‘I Get Wet’, and the undeniably powerful vision of its creator, have both proven influential and ahead of their time. The album’s relentless four-on-the-floor “up with everything” dance rock was a blast of fresh air, and anticipated the shape pop music to come a decade ahead of schedule. The result was a re-setting of the bar for rock music and performance, paving the way for more fun and positivity in culture. 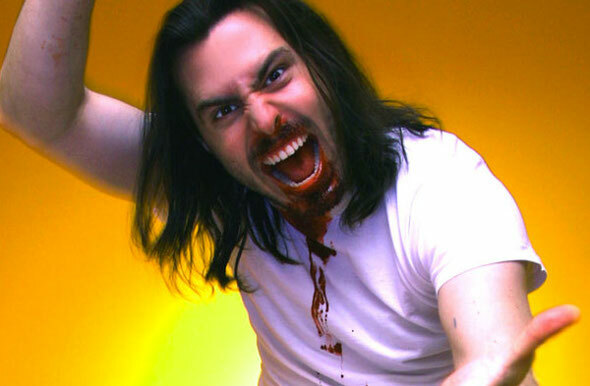 Known as the new ambassador of visceral rock & roll pleasure, Andrew W.K. Andrew’s furious delivery, charismatic charm, and energized enthusiasm continue to this day. Besides his own albums – which include a recent collection of improvised piano tracks (‘55 Cadillac’), and a tribute album for the Japanimation franchise Gundam - Andrew’s recent accomplishments include hosting the successful Cartoon Network TV program, “Destroy Build Destroy” - with over 1.7 million viewers a week, the program quickly became the #1 show in its time slot for boys 6-11 on ALL of television, and it earned Andrew the “Best Host” award from KidScreen, an youth TV industry publication. Andrew was invited to write and perform an official theme song to the 2012 World Snowboarding Championship in Oslo, Norway, and serve as the event’s musical diplomat. Andrew has also become a regular commentator on networks like VH1 and FOX. Recent years have even seen Andrew turning his positive message into motivational lectures at such Ivy League universities as Harvard and Yale, and working with such artists as reggae and dub pioneer, Lee “Scratch” Perry (receiving a Grammy nomination in 2009 for producing Perry’s ‘Repentance’ album), as well as artists such as Matt & Kim, Soulja Boy, Current 93, Good Charlotte, Steve Aoki, Rivers Cuomo and even The Simpsons animated series (Andrew W.K. performed the theme song for the legendary cartoon’s 20th anniversary episode). Tickets go on sale to the general public from today.